Pigmentation disorders are disfiguring and disturbing. Hyperpigmented patches in the form of lentigines, melasma, post-acne pigmentation and peri-orbital hypermelanosis are the ones that are commonly come across. Lentigines: These are small, 2-5mm size, dark brown to tan coloured lesions seen on the skin. They can occur both on the sun-exposed and sun-protected skin. In the elderly they are called as senile lentigines or ‘age-spots’. Sometimes they appear after acute or chronic sun exposure, hence they are called as ‘solar lentigines.’ Lentiginosis can be a feature of certain hereditary syndromes as well. Lentigines appear in childhood and increase in number up to adult life. Treatment includes use of sun screens, hydroquinone, retinoic acid, cryotherapy etc. Freckles: These are brown coloured small lesions that are present only on sun-exposed areas in fair-skinned individuals. They appear darker in summer than in winter. They are markers for individuals at risk for sun damage and sunlight induced tumors. Treatment includes use of sun screens, hydroquinone, retinoic acid, liquid nitrogen cryotherapy etc. Melasma is an acquired, light or dark brown pigementation seen on the face, particularly on the cheeks, central forehead, nose and the upper lip. Causes could be familial, pregnancy, use of oral contraceptives, certain medicines like phenytoin, menopause, idiopathic etc. The lesions progress after exposure to sunlight. Treatment: The response to treatment depends upon the level of the pigment and the duration of the pigmentation. Those developing during pregnancy may disappear spontaneously. Treatment includes sun screens, hydroquinone, retinoic acid, azelaic acid, kogic acid, topical vitamin C, chemical peeling etc. Post-inflammatory hyperpigmentation: It is a common problem in dark skinned individuals. 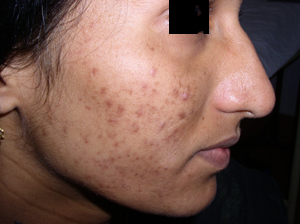 This can develop following acne, dermatitis, any type of trauma etc. The response to treatment is good when the pigmentation is in the superficial layers of the skin. Treatment includes mild topical steroids in early stages followed by hydroquinone and chemical peeling with trichloroacetic acid or glycolic acid. Sun screens containing titanium dioxide should be used daily. Other than the above mentioned modalities, pigmentation can also be treated with – Nd-YAG and Q switched ruby lasers also. Treatment of periorbital hyperpigmentation is less satisfactory. Drug induced – Minocycline, phenytoin, chlorpromazine, antimalarials, oral contraceptives, heavy metals like arsenic, antitumor agents like busulfan, bleomycin, cyclophosphamide etc. Treatment of diffuse hyperpigmentation includes treatment of underlying causes along with use of sunscreens and depigmenting agents like hydroquinone, azelaic acid, kogic acid, retinoic acid, glycolic acid and chemical peeling. Response to treatment may be partial. Properly chosen sun screens are the mainstay of treatment of pigmentation.